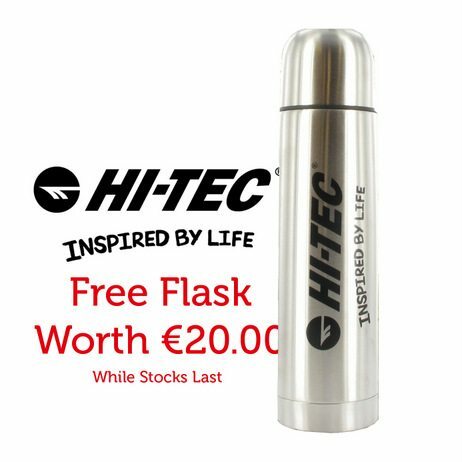 FREE flask worth €20.00 with every pair of Hi-Tec shoes sold online in July! It’s not necessarily the weather for hot drinks, but don’t forget, flasks keep drinks cold for up to 24 hours! With that in mind, it’s worth noting that Hi-Tec are giving a FREE flask with each pair of footwear that we sell on-line in the month of July. If you’re buying shoes for running, like the V-Lite infinity range, or boots for going places, like the Storm Mid or even just a pair of funky, comfy shoes, the Zuuk for instance, Hi-Tec have given us a FREE flask to ship with your on-line order. We’ll even give you a flask if you’re buying shoes for the Kids. This offer runs until we have no more flasks but fret ye not, we have lots!